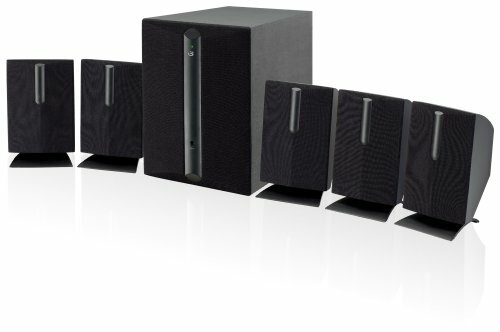 Complete your home theater experience with stunning sound from this 5.1 channel powered speaker system. Connect a TV, DVD player, video game system, MP3 player, or computer and enjoy virtual surround sound. The GPX HT050B Home Theater Speaker System includes a high power amplifier and 6 surround speakers: subwoofer, front left and right, rear left and right, and center. Each speaker grill is cloth-covered for a stylish design that works well with any home entertainment system. Digital volume and bass control knobs are on the back as well as RCA stereo audio inputs. Included in the box are the speakers, warranty card and user's guide. Impedance: Subwoofer- 4 Ohms; Speakers - 8 Ohms. For more than 30 years, GPX has offered one of the broadest portfolios of technology-driven consumer audio and video products. An award-winning consumer electronics company, GPX has built a solid reputation on excellent product quality, reliability, design, and affordability.